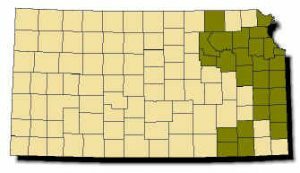 Range: Two populations, both restricted to the eastern third of Kansas; one in the Chautauqua Hills of southern Kansas west of the Verdigris River and a larger population found east of the Neosho River from Crawford County north to Doniphan County and west to Geary County along the Kansas River and its tributaries. 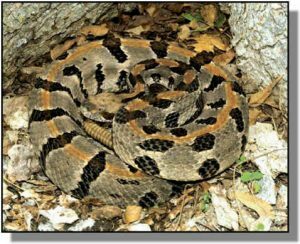 Description: Largest rattlesnake in Kansas. Pit on each side of head between and slightly below eye and nostril; large rattle at end of a jet black tail; small scales covering most of top of the head with one large scale over each eye; pattern of 18–33 dark bands or chevrons on the back. Head and body vary from pinkish gray to yellowish brown; rusty, reddish stripe often runs down middle of back. Belly grayish white. Young look like miniature adults. Habits: Active by day during spring and fall in rugged terrain along heavily vegetated, rocky outcrops on partially forested hillsides; in summer, moves to open sparsely wooded meadows and hillsides. Prowls at night during hot weather. Five to 14 young per litter are born in August, September, and October. Feeds on small mammals, as well as on smaller snakes.